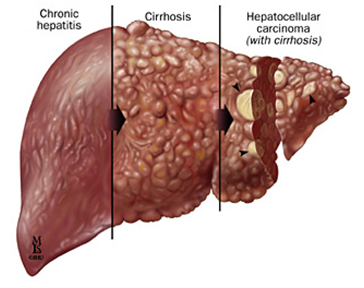 Cirrhosis is a slow progressing disease in which healthy liver tissue is replaced with scar tissue, preventing the liver from functioning properly. The scar tissue blocks the flow of blood through the liver and slows the processing of nutrients, hormones, drugs, and naturally produced toxins. Although less likely, other causes of cirrhosis include reactions to prescription drugs, prolonged exposure to environmental toxins, or parasitic infections. SAVLIV DROPS is the herbomineral formulation for treating Cirrhosis naturally. It contain anti-oxidant which treat liver cells naturally. Many of patient has taken SAVLIV DROPS and they are not on allopathic medication just SAVLIV is enough to treat CIRRHOSIS naturally and No side effect.